One question that has come up a few times is why make the GIs contemporary and not 1950s or 1960s? It’s simple: if you look at the Mars Attacks cards and comics they’ve always been set “now”, whenever that might be. The styles of the troopers has changed over the years, but not to reflect anything other than the idea that the invasion is happening right this minute – turn on CNN and you’ll see the saucers. Answering this question also made me think about other periods. We’ve already seen the Aztec and Knight characters in the comics (and the unpronounceable Aztec hero is already available in the KS). Why not other periods? After all, the Martians have been visiting Earth for centuries and if they bumped into Aztecs and knights then what about the folk in-between? Of course the Martian invaders wouldn’t change much. For our purposes that means not at all. There’s no need to invent changes just for the sake of it. The other side is the one that’s more varied. In rules terms there’s not much difference in soldiers from the last couple of hundred years. 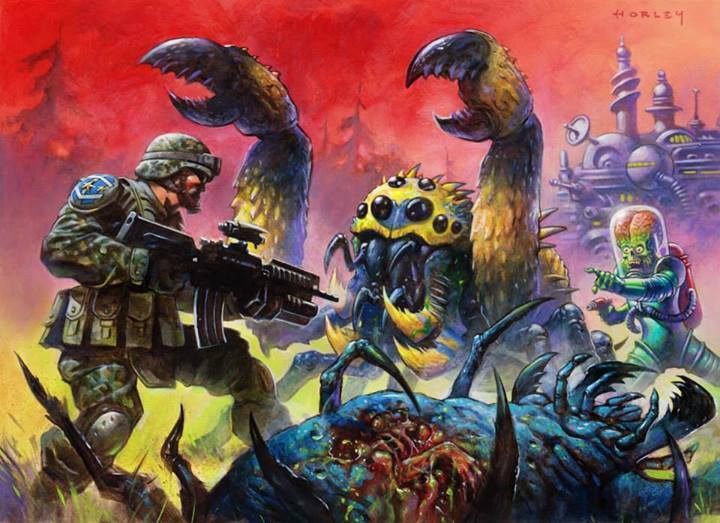 In fact, since America decided not to be a colony, a Martian invasion would meet similarly bolshy defenders with guns whenever they turned up. Fighting against pre-gunpowder warriors might need a tweak or two to feel right. I can’t imagine it would be a big change though. Pre-1908 (ish) you’d want to change flying car to flying cart. The card would work the same though. Pre-gunpowder you’d need to look at the artillery, mortars, etc, but ACW fights would work with them too. Strafing runs, on the other hand, are WWI and on. Like I said, a few tweaks, but nothing major. I honestly doubt that the KS would have had anything approaching the commercial success it has had, if Mantic had gone for the 60’s concept of the original cards… and I’m one of the few who wanted (still do in fact) a game based on the ‘originals’. With me the appeal of the ‘originals’ is pure nostalgia… but as you say the ‘now’ has always been the selling point and I doubt it was any different back in 1962. Had the cards back then featured WW1 Doughboys fighting Martians, I suspect we wouldn’t be having this discussion, as they were unlikely to have left the lasting impression they have, which has been built on since. 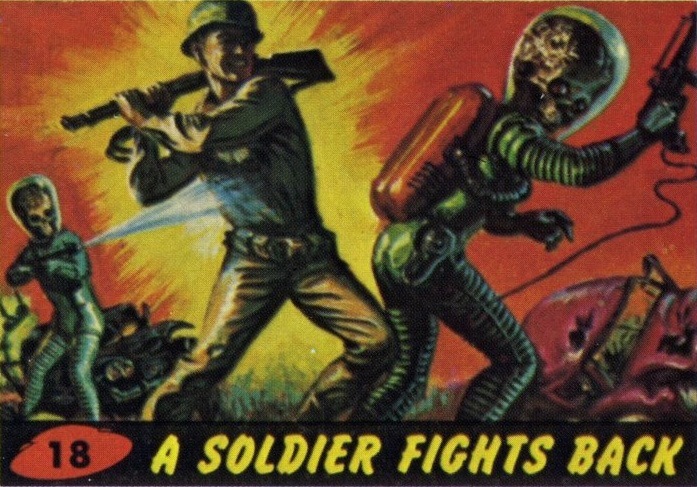 Instead the cards featured cutting edge military tech of the time (plus a look forwards to the near future as seen back then), with the conception of what ‘Alien Invaders’ would probably resemble, the ideas for which were culled from the numerous movies that had peppered the preceding decade. That image of the Martians has remained with us though and while ‘updating’ them might be ‘realistic’ it robs the game of much of its appeal. The ‘new’ cards/comics feature the same winning formula; cutting edge military tech of this time, with the ingrained image of the Martian Invader. So while a few of us 40-somethings and the odd retro-geek will strive to obtain Jeeps and ‘Army Men’ to capture our childhoods… the future success of the game, cards and comics lies with the ‘Now’ and ‘Tomorrow’..
Of course, there’s no reason you can’t have more than one version of the human defenders. The red brick scenery is largely the same for the last century, and a few items of street furniture could dress that up for a new period fairly simply. Swapping the modern GIs for older ones, or whatever, again is fairly simple. actually I would love to see some game expansions about different ages or different geografic areas, it would be very cool to have also themed terrains that matches the historical period… It would be quite interesting to see Martians fight ancient Japanese Samurai! yeah, it would be cool if there were time travel gates that open and bring or send people and things forward/back in time. Or maybe have revisionist historical battles or events that had martians secretly in them. Kinda like the Predator movie where they had the flashback of the aliens teaching Mayans or the Enterprise episode where the Nazis had alien help. It could also mean expanding Mantic’s model range to historical models too! I think it’ll be a while before that happens as they’re still working on filling in all their core ranges. So many things to do, so little time! Hey Jake, any word on when we’ll get new statlines? I know I must sound like a broken record but I’ve made all these nice cut out Martians and Soldiers. They yearn to draw blood. Paper-based blood. I’ve got a meeting tomorrow with the Mantic guys to check some stuff! and should be able to post up some stats either tomorrow evening or Tuesday depending on when we finish. Nice!!!! Any hints on what they might be so I can cut out the models from paper? Sorry about the delay. I’ve had a “good idea” which I need to check is possible logistically. Meeting postponed till weds. I’d start with the heroes to go alongside normal grunts for both sides. Hydra Miniatures produce some great minis that would work well alongside the Mars Attacks game. They have a range named “Retro Raygun”. Well worth a look for new enemies and allies. If you wanted to do a sort of Flash Gordon meets the Martians that would be a good place to start. 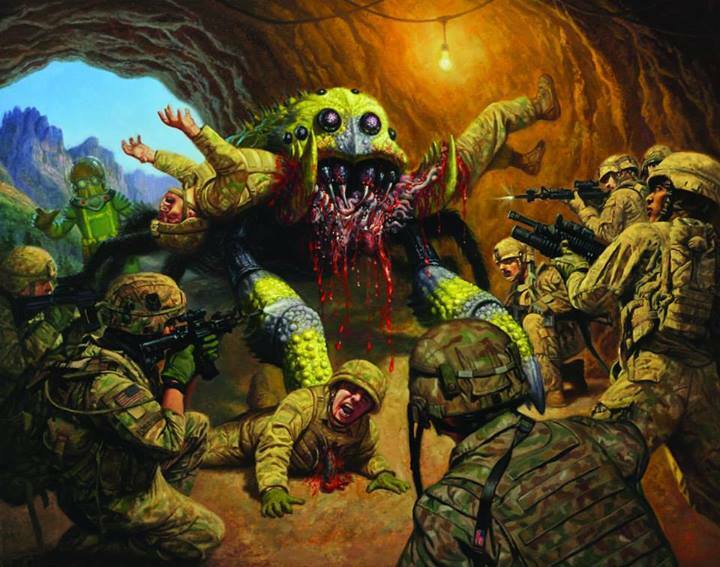 I plan on writing a scenario using Hydras Slithians against the Martians. I’m calling it “Invaders from Uranus”. Yeah I know, silly name. I’ll post it on the net somewhere and add a link in the Mars Attacks section of the Mantic forums when it’s done. I won’t be doing it until after the game is posted out to me in 2014 though as I will need to playtest it properly. I’ve been a gamer since 1980 and it’s getting about time I contributed to the community. Next year will be a busy year. I don’t want to say in case it’s not possible. Did you ever figure out if it was possible? Yup. Later today. The answer should be in what I can post tonight.